Newly built, modern and functional holiday home Istria Queen in the small place Zartinj, is only at 4 km from Labin and 8 km from the touristic place Rabac. The are only a few houses in the neighbourhood and thanks to the location of the swimming pool and the terrace, the guests enjoy their privacy and view of the green landscape. On enclosed property of 1000 sqm the guests can use a swimming pool of 32 sqm, spacious sunbathing area with 12 sun chairs, two covered terraces with sitting set, covered summer kitchen with barbecue, playground and four parking places. 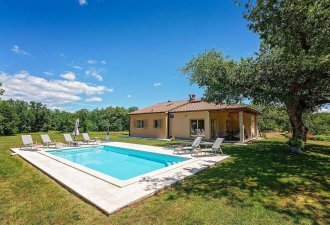 Villa Istria Queen consists of two separate units of in total 240 sqm on two floors. The houses have the same layout. On the ground floor, there is a fully equipped kitchen with dining table for six persons, living room, a bedroom with double bed and a shower/toilet. On the first floor are two bedrooms with double bed and a shower/toilet. The house is completely air conditioned.